For some reason I got off to a slow start this re-boot go around. So after not being as on top of things as I had hoped and letting a day get away without doing all the steps, today is day 3 and I’m finally getting into my re-boot groove! 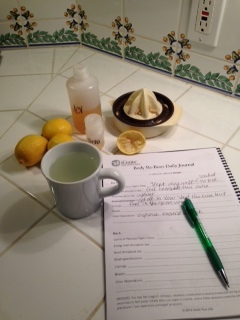 Got day 3 off to good start with hot lemon water instead of coffee. Ironically, I think my energy was much higher today! On day 1, I had a pretty big headache. Day 2 — a milder headache. I hadn’t slept that well either, so I decided to make sure to check everything off the list for day 3 to see if it helped. So far, so good! Last night I took my first epsom salt soak, turned off technology and slept like a baby. I awoke this third day feeling way more energetic. In fact, I have felt amazingly energetic all day. I’m thinking the lack of coffee in the morning is actually giving me more energy, because I’m not getting that dip that I usually feel when the caffeine runs out on me. Whoa! I hate the thought of giving up my morning Joe, but it may be really worth it!!! I had my lemon water and a KIND bar to start my day. KIND bars really help me when I need quick energy on the run; I usually eat half before a workout and the other half afterwards. After my iGnite workout for the day I fixed up a green smoothie with peaches. I had to run some errands this morning so I went ahead and fixed a tall iced apple cider vinegar and water with stevia and sipped on that around town. Meal 3 was a delicious ruby trout salad from Z Tejas. I’m pleased to say that I didn’t have my mid-afternoon slump today, but I did start getting a slight headache. I don’t usually eat out twice a day, but I had an out-of-town guest and that’s what we ended up doing. Soooo for dinner I had a power bowl with shredded chicken at Maudie’s. I avoided the chips and salsa and left feeling very satisfied. I got my cranberry water ready for day 4 and headed to the tub for a relaxing soak and some spinal twisting before another great night’s sleep! This entry was posted in Healthy Kitchen, Nutrition, Self-Improvement and tagged austin, caffeine, cleanse, detox, energy, ignite, ignite your life, nutrition, re-boot, Sha Klatt, wellness, womens health on September 25, 2014 by iGnite Your Life.